The Hai river flows through Tianjin, dividing the city into southern and northern halves. In the centre of Tianjin the riverfronts are beautifully set up, with promenades for pedestrians and elegant buildings. 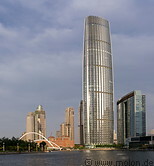 Close to the train station is a business district with many skyscrapers and the Tianjin World Financial Centre, a 334m high building. The Tianjin Eye is a giant panoramic wheel spanning across the Hai river.